If you’ve enjoyed these flourless pumpkin muffins (so many of you have and I’m so excited about that!) 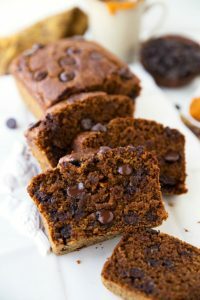 I posted last year, or gotten around to trying this best ever Greek yogurt pumpkin bread, I know you are going to LOVE this cake. It’s a dense, flavor-packed, delicious treat! That really isn’t too bad for you either! Some healthy desserts are just not worth it — give me all the calories instead, right?! 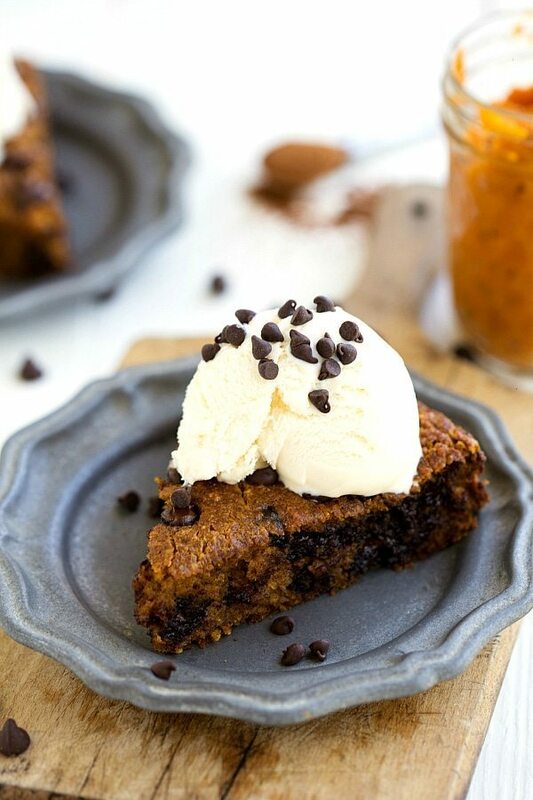 (Black bean brownies. Gross. Ahem.) This one, however, I would absolutely prefer over a regular cake because it is so tasty and much healthier! (And then I can “save” those extra calories for a full-calorie real brownie ;)) It’s also super easy to whip up — you only need one bowl, pretty standard ingredients, no hand mixers, and one baking pan. I tested this cake in both an 8 x 8 square pan and a circular cake pan — both will do the job just great! You may have wondered why I have so many gluten-free options on the blog. I’m not gluten-intolerant and neither is the husband or the babe. However, I do have two sisters that are gluten-intolerant. Anyways, I made this cake specifically for one of my sisters. She LOVES pumpkin and cake and chocolate so it was a perfect treat for her to enjoy! She absolutely loved it! And those that aren’t gluten-intolerant? They couldn’t believe it was so much healthier! Because this cake is SO much healthier than your traditional cake it is also a lot denser and has a moister texture. Both of which go really well with the pumpkin/fall spices and flavors. 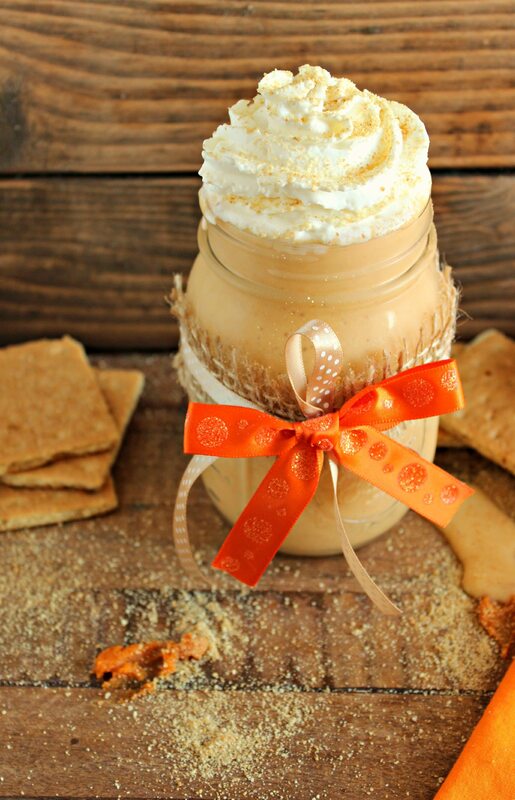 1 cup canned pumpkin not pumpkin pie filling and not an entire can! Preheat the oven to 350 degrees F. Grease and flour (with oat flour or regular flour if not gluten intolerant) a round cake pan or 8 x 8 baking pan. Make sure to be generous and flour it well as it can be tricky to get out! Alternatively line the pan with parchment paper or foil and lightly spray. In a large mixing bowl add the pumpkin (drab with a paper towel if it is excessively wet), applesauce, almond milk, melted coconut oil (measure when melted), large egg, vanilla extract, and sugar. If you are used to healthier desserts 1/3 cup should be plenty, if not (or you just want something a little sweeter) go for 1/2 cup. I usually use 1/3 cup + 1 tablespoon. Whisk until well combined. Add in the oat flour, cinnamon, allspice, nutmeg, baking soda, baking powder, and salt. Mix until just combined and then stir in the chocolate chips. Pour the batter into the prepared baking pan and bake for 40-50 minutes (8 x 8 baking pan took 40 minutes for me and the round baking pan took about 48-50 minutes) or until a toothpick when inserted comes out clean. Be careful to not over-bake the cake as that will take away a lot of the moistness/softness of it. Cool the cake for about 10 minutes before transferring out of the cake pan into a wire rack to allow it to further cool. If gluten-intolerant make sure to use gluten-free oats. Previous Post: « The Ultimate Bat Halloween Party! This cake sounds fantastic, Chelsea! 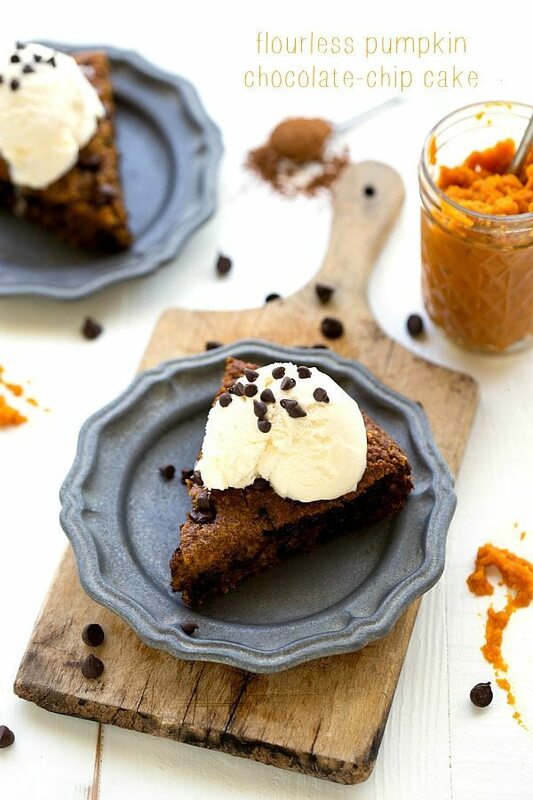 I love your flourless creations, especially since they involve pumpkin. Sounds just perfect! This looks so rich and dense. I’m dying to try this. I love that its gluten free too! 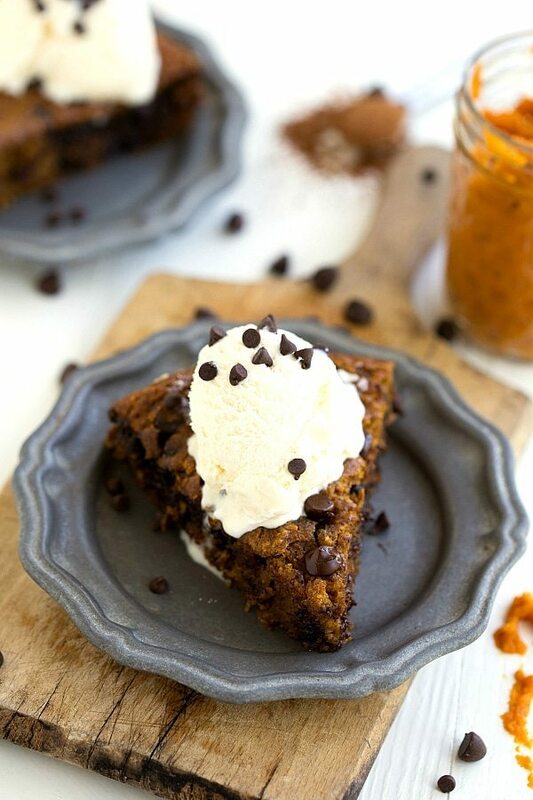 I love pumpkin and chocolate chips and I love where your head is on saving calories for future brownies LOL! Thanks for sharing. Do you think you could substitute honey for the sugar? And if so would it still be the same amount? This looks luscious! 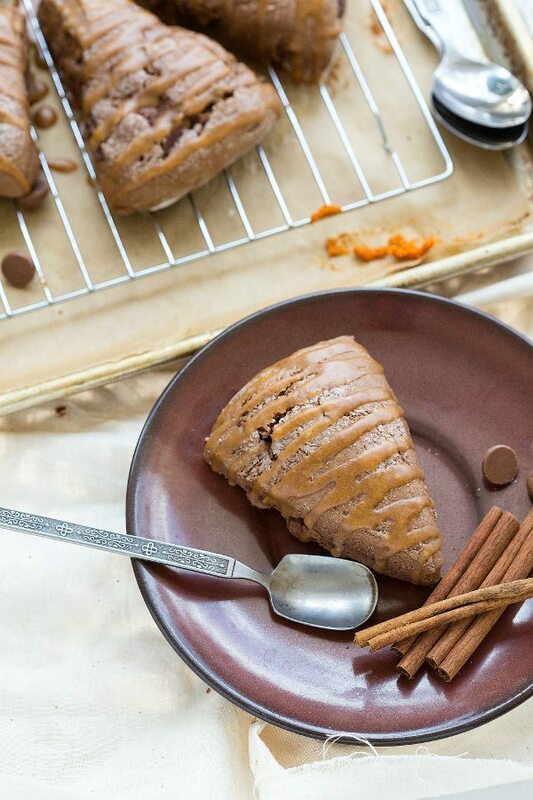 Pumpkin and Chocolate are great together. But I am way down here in New Zealand, so I will have to make my own pumpkin puree, what volume do I need? I’m going to sub in carrot or butternut puree, ’cause that’s what i have in excess right now! 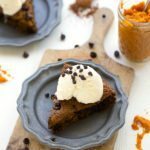 I encourage you to give bean brownies another shot – not that they’re necessarily healthier, but because they can be delicious and I hate to see things treated unfairly. I use a recipe that adds flour (sub gf if you need) as well as the beans – otherwise they’re gooey. But beans – and most are interchangeable, including chickpeas – even in small amounts will keep any brownie or cake recipe from becoming dry. And, like a grain of wheat or oat, they are merely a seed and are a tasteless base to carry other flavours – like chocolate! I used canned carrots when I didn’t have pumpkin. It was wonderful! My daughter loved it! I’ve made the pumpkin/chocolate chip with oat flour muffins about 11 times in 2 months. I keep them in the freezer and pop in the microwave when I want some. Heavenly! Thanks Chelsea. 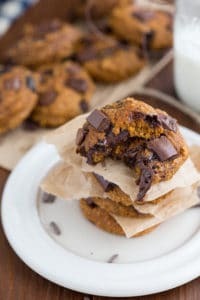 Can I substitute cocoa powder for the chocolate chips? Looking to stay away from the processed chips. I buy organic baking cocoa, would that work? 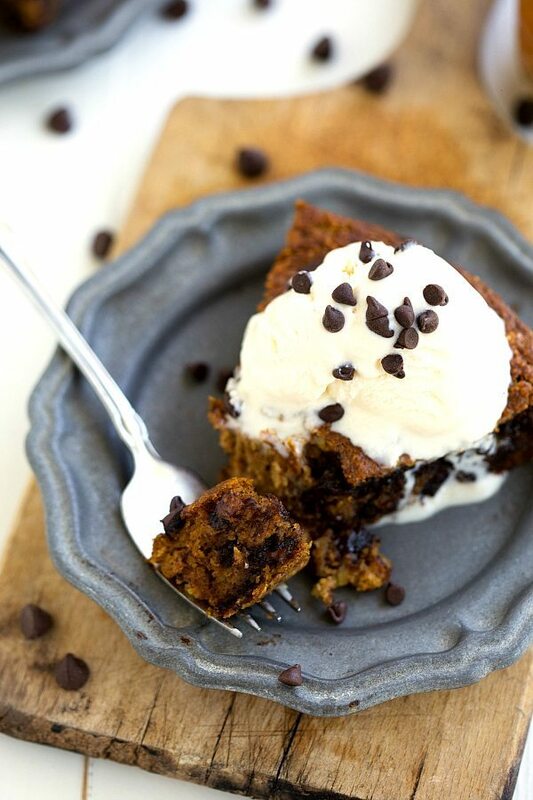 Do you have an alternate recipe that’s chocolaty that would use no chips? I would need to use the gluten free oats, so do I need Xanthan Gum? I want to make sure before trying these so I don’t mess it up. Thanks!